There is just something about chillies - they are addictive, both to eat AND to grow. Most chilli enthusiasts' decide to grow their own chillies rather than rely on the varieties available in the shops. Often, this decision is accompanied by the desire to grow the HOTTEST, most POWERFUL chillies possible. I, for one know someone near and dear who has made this his passion. 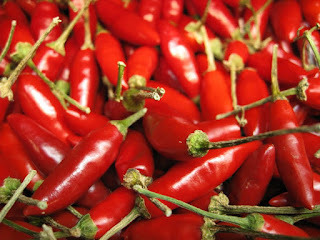 The substances that give chilli their intensity when ingested or applied topically are capsaicin and several related chemicals, collectively called capsaicinoids. There are many different varieties, ranging in heat ratings - from the ultra-mild to the lip blistering hottest. Obviously, your choice of chilli variety will play the biggest role in determining the potential for strength, but growing conditions ultimately play a part too. As a general rule of thumb the hotter varieties will be a lot harder to germinate and will be slower to grow and they will need more sunlight, warmth and a longer season for successful fruiting - perfect for the Coffs Coast. 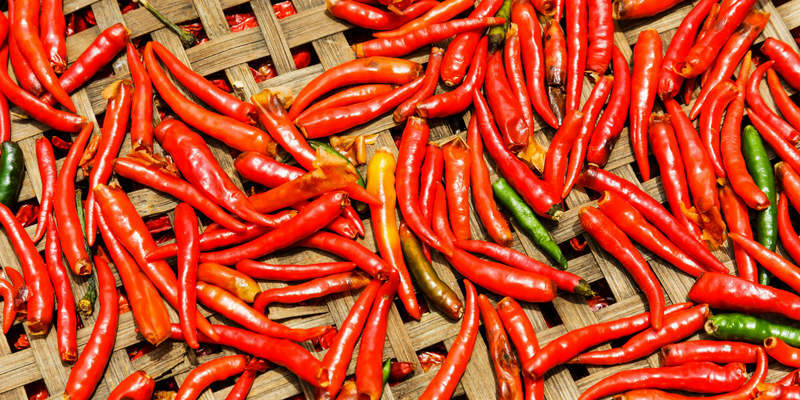 Chillies have been a part of the human diet in the Americas since at least 7500BC. 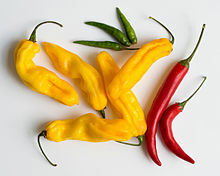 At sites in a tropical lowland area of southwestern Ecuador there is archaeological evidence that chilli peppers were domesticated more than 6000 years ago. 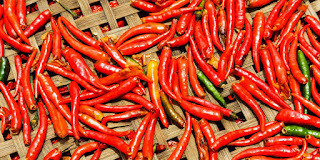 The chilli grains show that peppers were among the oldest domesticated foods in the hemisphere and is one of the first cultivated crops in Central and South Americas. The team of scientists who made the discovery say that the spice must have been transported over the Andes to what is now Ecuador as the chillies only grew naturally to the east of the mountain range. In Mexico chilli also has been used to spice up food since at least 400BC. This has been proven when researchers analysed fine scrapings from inside pottery, (dating back to that period) excavated in Chiapa de Corzo in southern Mexico. Ultra-performance liquid chromatography revealed the presence of Capsicum species in these vessels. To read further about this evidence please see this Smithsonian article. 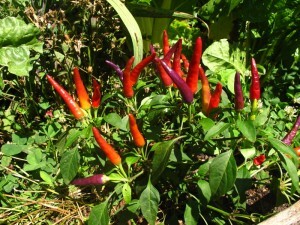 Chillies require a very sunny position with plenty of warmth to thrive and produce fiery fruit. They prefer a soil pH of between 6.5-7. If you're planting directly into the ground, then use a pH tester and add lime or acidic materials to adjust as necessary. However planting into containers gives you much finer control over the type of soil you use; a tomato blend is ideal for growing chillies. 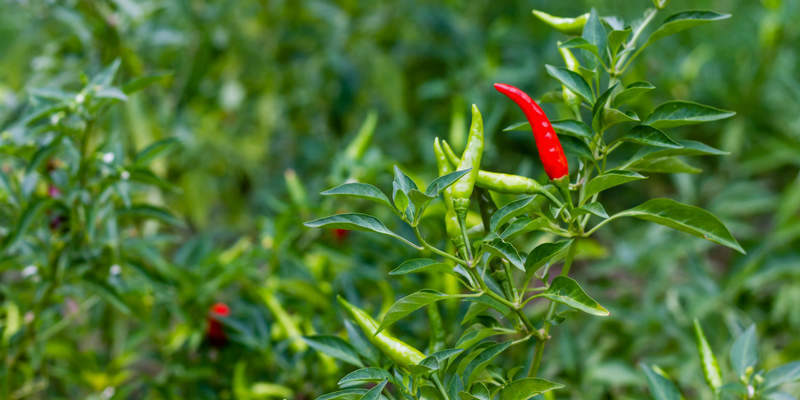 When feeding chillies, use a tomato formulated fertiliser, or a seaweed-based product. General purpose feeds high in nitrogen, urea, ammonium sulfate or fresh manure are not the way to go as they promote vigorous leaf growth at the expense of the flowers and fruit. Use a fertiliser that is rich in potassium and phosphorus instead. Nitrogen encourages leaf growth, which is why fertilisers with a higher ratio of nitrogen are an optimum choice for lawns and grasses. Phosphorus encourages flowering and therefore, fruiting. Potassium helps plants to move water and sugar inside themselves and thickens their cell walls. Some experts recommend the use of Sulphur in slightly alkaline soils. Be mindful not to overuse fertiliser as you may damage your plants. Too high a level of nutrients in the soil can send the plants into shock, slowing their growth, preventing the production of flowers and even causing leaf loss. Follow the recommended dosages on the packet and it is far better to use a light hand when applying, especially when containers are used. Never let your plants dry out completely, but at the same time don't over-water them. Keep the soil moist as far as possible, but err on the side of dryness rather than waterlogging the plants - this could lead to root rot. 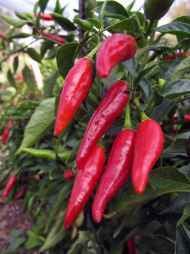 Chilli plants which are slightly under-watered stress will put more effort into producing fruit than foliage, and the resulting peppers will be much hotter. If you want to encourage bushier growth pinch out the plant tips occasionally. However, for maximum chilli heat, you want a large root system and not too many leaves, so that the plant puts most of its efforts into just a few fruit. This means that while pinching out your chilli plants may increase the yield, the heat will be reduced. 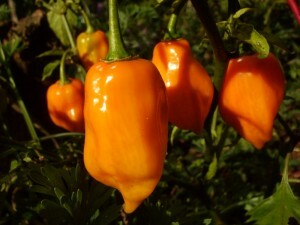 The longer you can leave the peppers to ripen on the plant, the hotter they will get. If your plant is particularly productive, consider picking half the fruits while they're immature, then removing any new flowers that appear so that the remaining peppers can be the focus of the plant's ripening activity. Don't leave them too long on the bush as they will become wrinkled. Chillies, like so many other plants can be fickle and you may have to experiment with varieties and growing conditions to find the ideal combination for your own location and climate. But be warned: this could turn into a lifelong obsession (and competition with your mates) - the quest for the perfectly hot and fiery pepper! 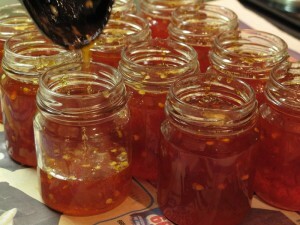 With the abundance of your efforts the following recipe from Jane Griffiths (http://www.janesdeliciousgarden.com/) might be a good way to use your harvest to the full. There is really no need to use jalapeno chillies - any chillies you have grown will be just as good. This jelly needs to be cooked in a very well ventilated position as it will make your eyes sting and the aroma to spread throughout your whole house! Any chilli preserving in our household is done OUTSIDE for that very reason. Cut the peppers into quarters and remove the white inner ribs. Puree the chillies and peppers in a food processor. Combine the puree and vinegar in a large pot and bring to the boil. Boil rapidly for around 10 minutes, stirring occasionally. Tie the lemon pips in a muslin bag, or put them side a tea strainer that closes, add them to the pot - the lemon pips contain plenty of pectin, the stuff that makes the jelly set. Now add the sugar and lemon juice, stirring well without boiling until the sugar has completely dissolved. Bring back to the boil and cook until it wrinkles when dropped onto a cold saucer. Pour the jelly into sterilised bottles and seal. Jane suggests to eat the jelly with Philadelphia cream cheese spread onto hot croissants. If you are wanting some fantastic expert advice on seed raising and care of chillies, see the following website http://thechillifactory.com/growing.